With its rugged antique charm and modern touches, this beautiful, bright, 5 bedroom mountain home provides space for large parties with coziness to accommodate a single family or a couple of friends. Take in breathtaking views of the neighborhood from the living room or any one of the 3 balconies, prep meals in the full kitchen or on the barbecue and enjoy your meal outside on the balcony table or indoors on our large wood table. 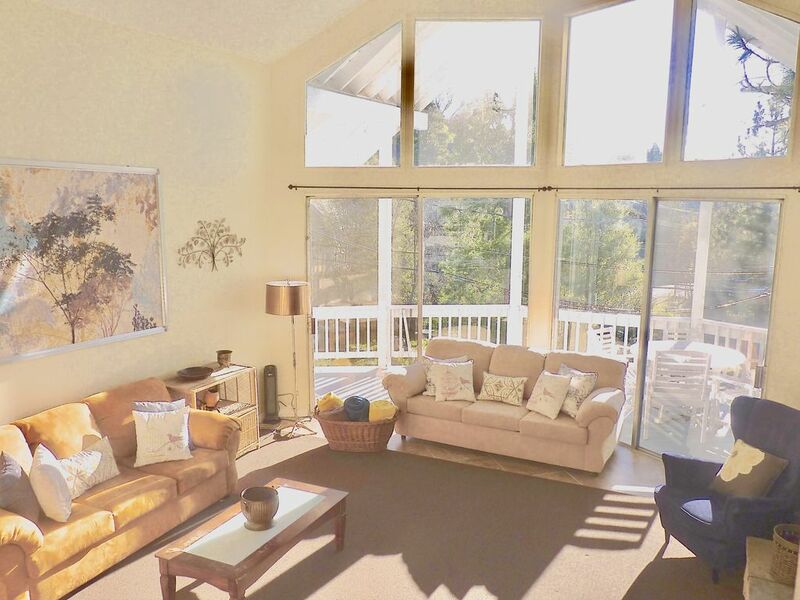 Cozy up on the couch to a movie or a book from our game room library, or walk, bike, or drive to the local museum, Lake Arrowhead Village, shops, cafes, or restaurants. Also enjoy sandy beaches, playground areas, snack bars, and lounge chairs at our local Tavern Bay Private Beach including Beach Club access! The living room is beautifully decorated with a charming and stylish mix of modern and antique furnishing. Enjoy floor to ceiling windows, a large stone fire place, and enough seating to accommodate everyone, regardless of your party size. The master suite also doubles as a family room (see 'see sleeping and bedding' category). Enjoy the use of our full kitchen (dishwasher, stove, oven, microwave, fridge, cooking/dinning needs, etc.). Eat your meals in our spacious formal dinning room , at the bar, or outside on the balcony. We are currently updating our bonus kitchen located on the 6th level in the master suite (AVAILABLE FOR USE IN THE NEAR FUTURE). 5 bedrooms: Each bedroom is individually themed, named after Shakespearean plays. Like the living room, they are beautifully decorated in modern and antique styles with the charm of a Bed and Breakfast. The 5th bedroom we lovingly call 'Much Ado About Nothing,' is located on the 6th level. It can double as a master suite or a family room. Occupying its own level (level 4) the master bedroom has its own fireplace and private balcony. Sheets and extra pillows are provided. Sleeps up to 16 people, with 3 sofa beds in our spacious living room, 1 sofa bed in the master bedroom and 1 sofa bed in the master suite. 3 bright, immaculately cleaned restrooms (2 private). There is parking for up to 6 cars outside of the garage (Please be mindful of our neighbors). Spend time in our large back yard, or sit in our quaint front yard sitting area. During the winter months, use our slopping drive way as a sledding hill. Enjoy breath taking views from our 3 balconies (2 private). COMING SOON: Lighted outside dining area. Sheets and extra pillows are provided along with all of your cooking needs. Towels are provided for up to 16 guests. You'll only need to bring blankets. Come live, laugh, and lounge!!! Absolutely No Smoking in the house or on the outside deck areas. I grew up in this home and, while I currently reside in Los Angeles, Ca, I still consider Lake Arrowhead my home from home. Naturally, I am very sentimental about this home, given that I spent my of childhood and adolescent years here. While this is an older property, its age adds to its charm. Each one of the rooms has its own unique charm, all of them adding to the warmth and hospitality of the environment. When I visit with my family, I am still in awe of the way the living room looks early in the morning when the sun is rising. It is moments like these that I wish for all of our guests to experience when they visit our home. I want our guest to feel as if this is their home. Antique finishes and furniture with modern amenities, accents, comforts. This home allows you to experience all the allure of mountain living while still having access to modern appliances. By staying in our property, guest also have access to Tavern Bay's private beach and beach clubs, over 60 lake trails, use of Grass Valley, and Peninsula Parks, and lake fishing. Very nice kitchen and dining area. The living room is big and has lot of natural light. We had big group of adults and kids, and this house had enough space to accommodate us. We will come back. The hostess was extremely helpful and kind. They greeted us with cookies and tea and the kitchen was fully functional for anything you might cook. The beds were good. The only thing is the top bedroom is hot if someone wanted to use that room— we didn’t use that room so it didn’t affect our stay at all but if you need the extra queen it was hot at this time of year. The parking was perfect Andy he views spectacular! It was a pleasant get away spot. We spent a weekend there with 14 people in April 1014, really enjoyed the house. It has many rooms - it enables various sleeping accommodations, including some very romantic rooms great for couples. One of them is like a full sweet with separate bathroom and kitchen. There's a huge living room (with a view! ), nice patio, a fireplace, a grill. The downstairs kitchen is newly renovated with marble work spaces and allows many people to cook together. There is a big family table that enabled all of us to sit together and eat. The kitchen has also a lovely spacious nook where you can chill, look outside and enjoy your morning coffee. The fridge is big and the kitchen utensils are adequate. I think the only thing we forgot and did not find was pepper :) And even though we never had time for it, an upstairs games room with a pool table is definitely a plus. The manager Lynne was really sweet, accommodating and had a great sense of humor. The entrance could be a little tricky in the dark (the GPS does not not lead you to the alley and the front entrance is steep), so it is important to follow the driving directions. Overall, a great stay and an excellent value for the money. Thank you! We greatly appreciate such wonderful feedback! We hope that all of our future guests have an equally enjoyable experience with us and welcome feedback to further that purpose. About 5 min. from stores and movie theatre. Give access to at least one garage to park. This would help loading and unloading. It is also nice during cold days. It might require you fix the automatic garage door. In our efforts to ensure the best possible experience for all of our guests, new and returning, we welcome and appreciate any and all feedback from our guest. The damaged chairs have been repaired. Wifi has been installed and is now available for our guest. We have made arrangements for the removal of all trash even between pick-up/drop off days (the between day being the cause for trash being on the property on day of your arrival). The balcony is currently undergoing repairs and will be completed by February 8, 2013. All suggestions for management have been taken into consideration and have been the catalyst for property updates including but not limited to new stainless steel cookware and hand soap and kitchen towels availability. A list of kitchen items will be posted on the vacation site shortly. We will be working with our capable provider to ensure that all televisions are operable and hassle free. Hiking, Mountain History Museum, baseball, basket ball, (local middle school grounds), bird watching. Enjoy fishing, beaches, playground areas, snack bars, and lounge chairs and access to private Beach Clubs. Theater, library, shopping, and dinning, fishing, boating, water skiing, free concerts (ask in the Lake Arrowhead Village for featured bands), dancing, local bars, bowling, spa, horse back riding, water ferry rides, lollipop park, skiing, snowboarding (Big Bear ~ 30 min), mountain biking.